AAIW is a low salinity water mass that fills most of the southern hemisphere and the tropical oceans at about 800 to 1000 m depth (the area coloroed dark green in the figure above). 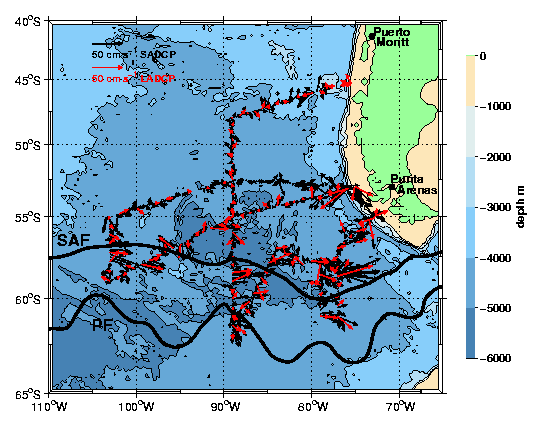 As the densest of the circumpolar Subantarctic Mode Waters (SAMW), AAIW is formed as a thick, outcropping mixed layer in the southeastern Pacific just north of the Subantarctic Front (SAF). SAMW and AAIW formation have a major impact on the oceanic sink for anthropogenic CO2, whose largest uncertainty is at intermediate depths. AAIW has a major role in southern hemisphere freshwater transport and as such, can impact global-scale ocean overturning processes. AAIW is the only intermediate-depth, large-scale water mass that has not been studied at its winter source, despite general knowledge of the location of the source region for several decades. Results from this region will be relevant to SAMW formation in other regions. 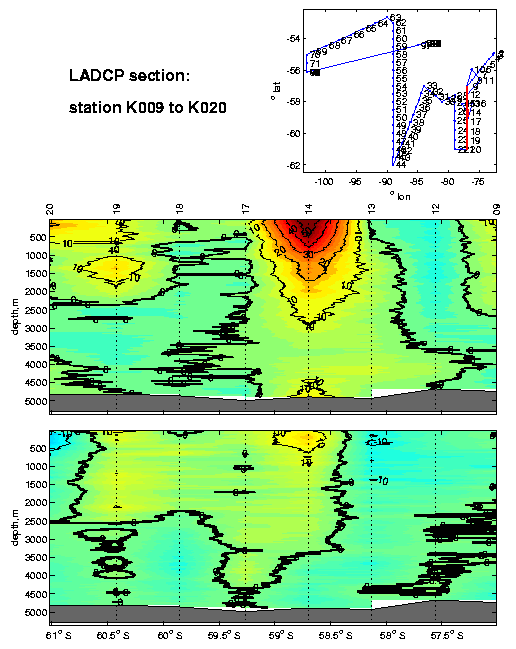 The plan is to study (1) northward Ekman advection of Antarctic Circumpolar Current surface waters across the SAF, (2) convection driven by local air-sea fluxes, and (3) northward subduction of AAIW across the northern front bounding the deep mixing region. The program includes a winter hydrographic survey of the AAIW outcropping region and the fronts that bound it, and a follow-on summer survey to study the evolution, restratification, and dispersal of the previous winter's waters. Shipboard measurements include CTD, salinity, oxygen, nutrients, XCTD, ADCP, LADCP, shipboard meteorology, CFCs, CO2, underway N2O and CO2, underway T/S/O2. We will deploy floats for ARGO and a surface drifter with a pCO2 sensor. AAIW05 CTD cruise report pdf. AAIW05 LADCP cruise report pdf. AAIW05 XCTD cruise report pdf. Figure 1: AAIW winter 2005 cruise track. Filled circles mark the locations of CTD/LADCP stations. ARGO floats were deployed at the stations highlighted in red. Underway measurements included XCTDs, about 3 per station interval, and 2 shipboard ADCPs: an RDI NB150 and an OS75. The mean locations (Orsi et al. 1995) of the Polar Front (PF) and the Subantarctic Front (SAF) are indicated. The Subantarctic Mode Water Front SAMWF is the climatological maximum in the wind stress. In the mean, the wind is upwelling favorable everywhere south of the SAMWF. Figure 2: OS75 shipboard ADCP (black) and Lowered ADCP (red) velocity vectors at 150 m depth. The eastern SAF jet is a clear signal in the velocity vectors. Note that the SAF was south of its mean location on our 4 westernmost crossings, but north of the mean location on our 2 easternmost crossings. 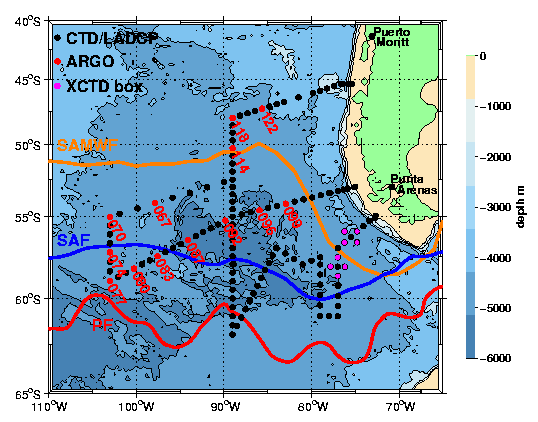 Figure 3: Easternmost LADCP section of ocean currents across the SAF (Stations 9 to 20). Top panel is zonal currents; lower panel is meridional currents.